Horse access is permitted throughout the area except in Zone A between October 1 and May 1. Larger groups should call the Hullett Office before horseback riding in Zone A. It is always best to map out your plan before you go. The trails are all of various lengths, and many intersect. The trail system has three sections - the Sugar Bush, the Green Dragon and Dyke Trail Systems. The Sugar Bush consists of the Blue, Yellow and Purple trails while the Green Dragon consists of the White and Green trails. 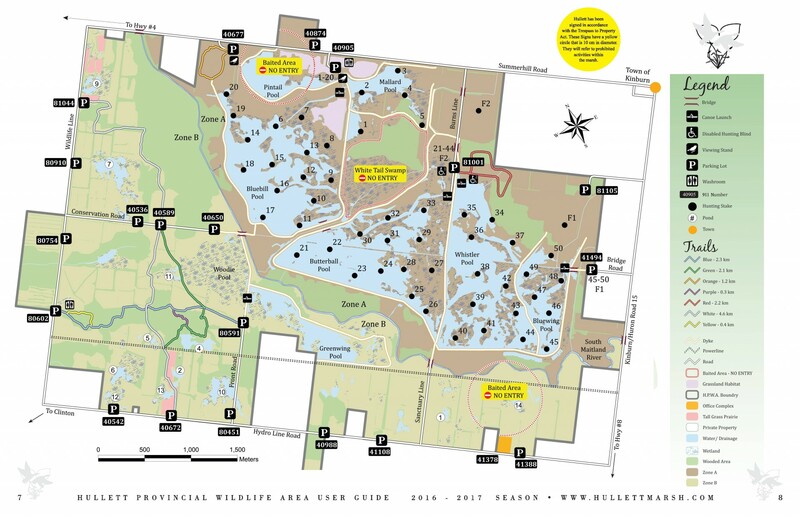 The trails have a wide variety of scenery from deciduous forest to panoramic views of the various pools, ponds, marshes and swamps at the Hullett Wildlife Area. The White trail is close to agricultural fields, fallow fields, lush ferns, wooded areas, and ponds - presenting a good opportunity for wildlife viewing. The Dyke trail system is perfect for viewing waterfowl and wildlife such as beaver, muskrats, mink, and deer. The dyke tops, sometimes rising 8 meters above the water's surface, are great locations for photographers and bird watchers. The HPWA provides habitat for over 180 species of birds and over 400 plant species. On these trails, you can see deer, ducks, tall grass prairies, wildflowers and much more. There are also beaver dams, lodges, mallard tubes and wood duck boxes here to view!